I’ll share my reasons why I Jasper National Park is one of my favourites, with first-hand experience when I visited the park, including it’s cool Athabasca Glacier (pun intended). First off, I’d like to say that Jasper National park is absolutely Stunning. There are amazing Waterfalls, Hotsprings, Rapids, the Athabasca Glacier and more. Upon entering Jasper, my brother and I were greeted by the entry booths, which charge about $20 per car just for a day pass into the park. If you plan to camp, expect to pay between $15 and $38 dollars per night extra on top of the day fee. After the entry booths though, we came and were greeted by a male elk with several females grazing along the side of the highway along with plenty of pulled over cars and tourists taking pictures of these amazing creatures. One brave tourist even walked closer to the male elk and nearly got charged! Jasper National Park is not the kind of place where you will save money, but the views are spectacular. In the middle of the park there is the town of Jasper which is surrounded by mountains on all sides, meaning that everywhere you look the view is fabulous. 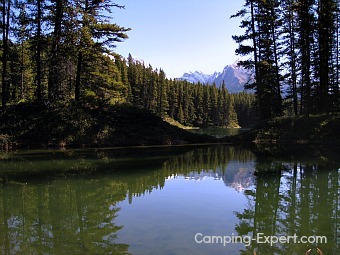 · Self register camp areas such as at Pocahontas near Miette Hotsprings, or camping by the Icefield centre are cheaper camp areas. They have fewer facilities, but taps and outhouses are all that are really necessary (in my opinion). The view from the Icefield camp area is of the Athabasca glacier, which is quite beautiful, however the ice makes the area much chillier than other camp areas in Jasper National Park. · Full Service- Other camp areas such as Wilcox creek offer kitchen shelters and trailer sewage disposal for campers and RV’s. The more services the campground offers, the more expensive the camping. 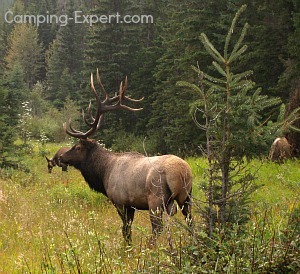 There are around 10 different camp areas with walk-in tent sites to sites with electrical hooke ups. Whislters has nearly 800 sites is the biggest camp area in the park. You can reserve campsites at pccamping.ca, or phone 1877-737-3783 or get sites on a first come first serve basis. Camping in Jasper National Park is available from mid May to early September with limited camping areas open during the rest of the year. If you like to hike, there are around 1000 kilometres of trails that can keep you busy for days and probably years. We drove down the road to Malagne lake and Canyon. There are several trails by the Maligne lake and moose lake, some shorter and well groomed and other longer ones if you are more into a good strenuous hike. The Maligne canyon hike is also worth the trip. The hike takes you along either side of the rushing green water below, with several bridges where you can see the water cascade by! The power and force of the water here is amazing! Driving along the highways in Jasper, you are sure to come across some sort of wildlife, from elk, mountain goats, porcupine or big horn sheep along the rock faces. There are also wolves, moose, cougars, coyotes, deer and black and grizzley bears. Elk are the most dangerous animals in Jasper National Park, so make sure to keep your distance. Since there is a good chance you’ll see some wildlife along the highway, pay close attention and drive carefully, particularly between dawn and dusk. When we first arrived, later in the day, we decided to head to the hot springs. These cost $6.50 per person for a single entry. They are quite commercial - with showers, and a small cafe (at least in my opinion of hot springs as the ones I’ve been to have always been remote), but it doesn’t mean they are not worth the visit. You can even rent swimsuits if you forgot your own. There are 4 pools. One being lukish warm, another being quite warm (hottest in the Rockies at 53.9 C), and two that are cold are much colder. Many people like to go from the hot pool to the colder ones and back to the hot one. For entertainment, chill out (literally) in the cool pool and watch the reactions of the people peoples from the cold water. Definitely entertaining! There are a several companies that offer river rafting along either the Athabaska river, or Sunwapta rapids. These can be easy meandering trips for the whole family or white water rafting for the more adventurous. Later in the season (September), the rapids are less dramatic, and thrilling. If you’re less into adrenaline pumping, then perhaps a float trip is more up your alley, where the guides do the paddling, and you relax. There are 3 ways to visit the Athabasca glacier. The most destructive to the Athabasca glacier is the Brewster IceExplorer Snowcoach which drives a HUGE school bus/monster truck onto the ice where you can walk on the ice. This can be busy during the summer season. It is not very good for the Athabasca glacier and not very eco-friendly. The second option is to do an ice hike. This company is very environmentally friendly and doesn’t even advertise. Once in the park, visit a visitor centre and they can put you in touch with the company. They lead small group tours onto the ice. The final way to visit the Athabasca glacier is to hike up near it. You do not get to walk onto the ice (this is dangerous), but you can feel the cold emanating from the Athabasca glacier and you get a good view. This is the cheapest option cause it’s free! 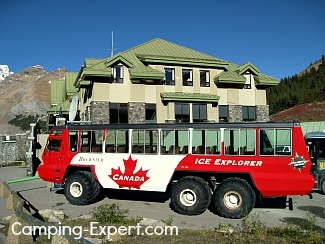 There is also a museum at Icefield Centre which is an education on glaciers. 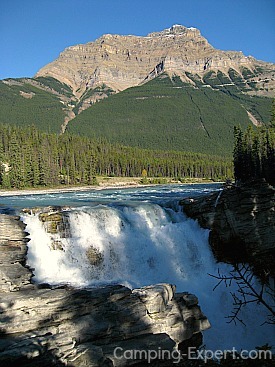 There are several waterfalls in Jasper National Park. My favourite was Athabaska Falls which was very beautiful. Sunwupta falls is also quite pretty. There are shorter walks that take you to different view points of the falls. Being a huge dive fanatic, I have to include diving. There is a small company that is open only in the summer months. Some of the other things that you can do in Jasper are: Horseback riding, museums, tramway, wildlife tours, enjoy restaurants, fishing, boat tours to spirit island on Maligne Lake, golfing, shopping and art galleries in town, Helicopter tours, Mountain biking, Canoeing and Kayaking and even Afternoon tea. In the winter there is: Dog sledding, Skiing, Snowboarding, Ice skating, Tobagganing. I thoroughly enjoyed my visit to Jasper park and will definitely be going back! There is so much to do and it is absolutely beautiful! The Icefields Parkway highway from Jasper to Banff is claimed to be the most beautiful road. Fact: The icefields parkway was built by unemployed men in 1931, and the men were paid 20 cents a day!